We're rolling out PlayStation 4 review coverage all the way through the launch on Nov. 15. Check out more coverage here! Knack is a sentient golem magically drawn together from shiny bits, baubles and two thick eyebrows. Each part of Knack's body, whether it's a hand, leg or his bell-shaped head, is made out of mined relics, which in his world are also used to power cartoonish cars, airplanes and generators. A real-world equivalent to Knack and his physical composition, then, would be a creature made entirely of some other combustible, unearthed fuel – like coal. This should give you some idea as to what kind of message this PS4 game will send as a Christmas gift. Knack's pleasant wrapping is deceptive, and sadly indicative of how far its good intentions diverge from the execution. It shines in the opening, in which Knack walks through a series of test rooms, demonstrating his pugilistic prowess against adorable, antagonistic Roombas. His inventor, Dr. Vargas, narrates as you play, explaining how Knack can increase his size if he gathers more relics, or blast his parts out in a destructive whirlwind. Sure, the laboratory is utterly sterile, nothing more than a series of squares, cordoned off until you smash a handful of enemies and move on. But it works as an introduction, and you sense greater possibilities waiting just outside the bare walls of this tutorial. Sadly, you never truly leave the laboratory, even as Knack's adventures appear to take him through forests, red-hot caverns and the outposts set up by an army of war-craving goblins. It's just arena after arena of similar enemies, and the same three-hit punch to take them out. When Knack grows to enormous size, he simply faces larger foes, and those that don't grow are trivial conquests to be slapped aside. An automatic, elevated camera keeps things simple in Knack, hearkening back to the straightforward, character-driven legacy of Crash Bandicoot. Its vibrant colors and pudgy characters are inviting, and its enemies telegraph their attacks in obvious, well-animated ways. If read only by its blueprints, Knack is a game about watching these attacks and retaliating in an opportune window; about being economical in your movements. But there's no growth to that idea, and no expression of it outside a string of closed-off squares. The static level design borrows the worst part of Disneyland, which is the meandering, zig-zagging line-maze that winds up and down, here and there, and ultimately hides the fact that you've barely gotten closer to the ride. Even the casual players I roped in to play Knack with me started to reject this pattern, sensitive to the ruthless repetition passed off as accessibility. The few secret areas that do show up are hidden behind obvious walls, which nearly all require an identical traversal down stairs to a waiting treasure chest. Even when Knack looks to experiment and build himself out of different materials, the results feel rote and ineffectual. When he's made of ice, you have an implied time limit as he melts away in the sun. When he's made of crystal he can slip through security lasers undetected, but can still summon his non-crystal parts to the other side instantly. 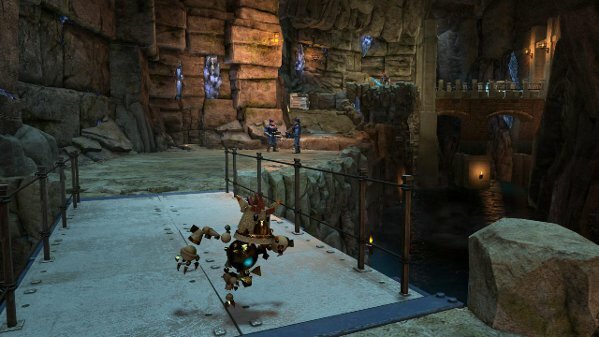 For "stealth," Knack is smaller, weaker and – more importantly – different for all of three seconds. Ah, but it's not meant to be hard, you think, not having discovered Knack's insane propensity for insta-killing its players. When Knack is tiny, a single impact from a goblin arrow could shatter him, but rather than reconstituting himself he returns to a groan-worthy checkpoint. It's difficult to conjure goodwill for a game that is somehow both trivial and suddenly punitive. Dropping it down to Easy helps, as you might expect, as does adding a second player. Player 2 pilots Robo Knack, a small bot that can donate his health to Knack Proper in a quaint act of golem-to-golem subservience. Having two characters on screen puts a mattress over the game's strangest difficulty spikes, but it also highlights a major problem: The camera is practically unaware of Robo Knack, failing to follow him even if he's being pummeled outside of view. Player 2 lives on uncertainty, never sure where the camera might go or when a cutscene will warp him to some off-screen limbo. At this point, you might try to latch on to Knack's cartoon stylings and the cast of stout, squabbling humans. It's vaguely unsettling that Knack himself is shunted around like a slave, with Dr. Vargas and his generic assistant sending him into danger while they hang way, way back. During their attempts to find the source of a goblin army's unusually sophisticated weaponry, an evil industrialist attempts to capture Knack for use as a skeleton key in a mysterious tomb. So, no, it's not exactly Pixar. To find real offense you'll have to look at the game's embarrassing female characters. One literally pleads to be rescued, despite being a clever inventor herself, and the other, Katrina, pilots a purple mech equipped with long hair and high heels. There's a danger of these complaints being interpreted as an adverse reaction to Knack's simplicity, style of graphics or wildly oscillating challenge – as a case of "it's just not for you." That, however, would mean that some people are content with slogging through a monotonous, charmless game just because it's pitched at their level. Knack fails to capitalize on its own ideas and structure, and is successful only as a reminder of the shallow, punishing platformers from a time when we really cared about how many bits there were on your console. This review is based on review code of Knack, provided by Sony.